Winter is upon us here in Portlandia but there's no need to huddle up inside. As always, there's an event for everyone this month in Portland. Feeling hungry and adventurous? Take a trek to Portland's Night Market. Want to get dressed up and catch a Tony award-winning musical? Check out Ain't Misbehavin' at Portland Center Stage. Or maybe you'd like to combine your love of yoga and beer? The Commons Brewery has you covered. Portland is definitely not short on fun happenings before the holidays hit. So, without further ado, November's list of not-to-miss events in the Rose City. 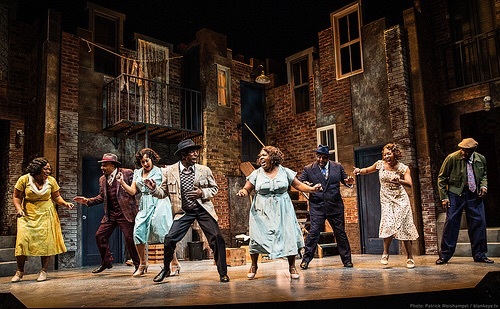 Ain't Misbehavin' at Portland Center Stage | Photo credit: Patrick Weishampel/blankeye.tv. Get dressed up and hit the town for Portland Center Stage's latest show— Tony award-winning Best Musical, Ain't Misbehavin'. The fast-paced show pays tribute to the songs of legendary jazz songwriter Fats Waller during the Harlem Rennaisance. This show is easily one of my favorite shows I've seen at Portland Center Stage, and maybe of all time. The singing, the acting, the costumes and the visual effects of the rotating stage are fantastic. This is a show you won't want to miss. Portland book worms and writers, rejoice! Take a break from National Novel Writing Month and check out 40 events, 17 workshops, a book fair with over 60 local and national publishing vendors, or chat with one of 80 participating authors. One of the most interesting aspects of Wordstock are the pop-up fiction, nonfiction, poetry, and music events occurring throughout the rooms and side galleries of the Portland Art Museum. Portland gets a taste of the Big Easy just in time for the cooler weather. Acadia is heating up this November with Gumbo Weekend, when Chef/Owner Seamus Foran will serve a flight of regional Louisiana gumbo in honor of the famous Treme Gumbo Festival. The trio will include: Seafood Gumbo – the classic NOLA gumbo served with shrimp crawfish and Louisiana blue crab; Cajun Gumbo – a southwest Louisiana style with a hearty tomato-based stew, chicken and andouille sausage; and Gumbo Z'herbs – a gumbo popular in southern Louisiana with the Catholic population for it's "Lent-approved" leafy-greens rather than meat filling. Come hungry. November 20-21, 4-10pm, 106 SE Alder St.
Adventurous foodies take to the Central Eastside Industrial District for Portland's own night market featuring unique street food-inspired eats from local restaurants and food trucks. Expect an exploration of dishes, drinks, and live musical acts all in the span of one city block. In addition to a constantly rotating selection of killer beers on tap and one of the most down-to-earth craft brewery atmospheres in Portland, Base Camp Brewing Company hosts a wide selection of outdoors themed events. Adventure Film Fest North West hosted by Rare Earth Adventures is Portland first amateur Adventure Film Fest. After a few outdoor adventure flicks and a cold s'mores stout, Tuesday never looked so good. Oregon's snowpocalypse hasn't made it's debut...yet, however, the good people at 10 Barrel Brewing are out to see that it does. Expect solid brews such as the release of the 2015 Pray for Snow Winter Ale, live music, giveaways at the first ever block party on NW 14th and Flanders. Event proceeds will be donated to Children's Cancer Association. Presented by Mazamas, this rockin' festival showcases clinics, workshops, seminars, and a speaker series all dedicated to the love of rock climbing, mountaineering, and the great outdoors. Keynote speakers include Jim Whittaker, internationally renowned as the first American to summit Mt. Everest (among many accolades), and world-class American rock climber, Alex Honnold.